The circumstances in which Lawrence Gatitu lost over 350,000 in less than 8 hours are still shocking. Please lend me your time for a moment, especially if you walk around with your ATM card. I lost mine on the night of Tuesday October 20 and there is something weird in the way I lost Sh 377,133 in five different transactions that happened in four different places in less than eight hours. As I come to terms with that, I have decided to share my ordeal with the media. Something will come out of this, I believe. By the way, my name is Lawrence Gatitu Mbugua. I’m an accountant based in Nyeri. I had gone to watch Arsenal tackle Bayern Munich in a Uefa Champions’ League clash when the drama started. I believe I was pickpocketed inside Nyeri’s Bells Pub as I enjoyed the match. I lost my wallet that had cash, my national identity card and the ATM card that is property of the Co-operative Bank. As soon as I realised the wallet was gone, I rushed to the nearest Co-operative branch where I met a night shift guard by the name Evans Nyandika. He was kind enough to give me his phone, with which I called the bank and asked them to block any transactions. That was about 1am. Assured that things were under control, I headed home. Shock confronted me the next morning when I got my bank statement. It was printed on Wednesday 9.01am and it told a grim story. 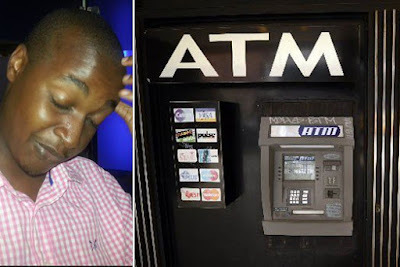 Sh 40,000 was withdrawn from an ATM in Nyeri, then later Sh 36,645 spent at an outlet that is entered in the statement as “Tusker Mattresses Thika” that is in “Nairobi Kenya”. Then there was another spending of Sh 82,995 at an outlet listed as “Tuskys Chania Till 19” that is in “Thika Kenya”. Strangely, this one was entered as a double transaction, meaning Sh 165,990 was spent in that transaction. Another Sh 40,000 was withdrawn from an ATM at Tom Mboya in Nairobi before a final expenditure of Sh 94,498 was incurred at an outlet listed as “Fone Xpress Prestige” in Nairobi. I was then assured by the bank that the account was now totally blocked and no other transaction would take place. The statement doesn’t show the times the withdrawals happened and one question disturbs me: could those transactions have happened at night? I recorded a statement at the Nyeri police station that Wednesday, and so did the guard who helped me out. I have also visited my bank and the involved retailers to get an explanation over the matter. But I am still at a loss. A Tuskys official told me on Thursday that they do not have till number 19 at their Thika branch; that they have only 12 tills. The bank insists that it should have been my responsibility to safeguard the PIN number of my ATM, which I agree with. But I am ready to shout from any rooftop that my PIN wasn’t anywhere on my wallet. My greatest worry is that some transactions could have happened even after the Co-op bank representative assured me by phone that my account was blocked. Or my card could have been hacked into. As I try to put together the pieces of this jigsaw, a brief message from me: be careful, guys.